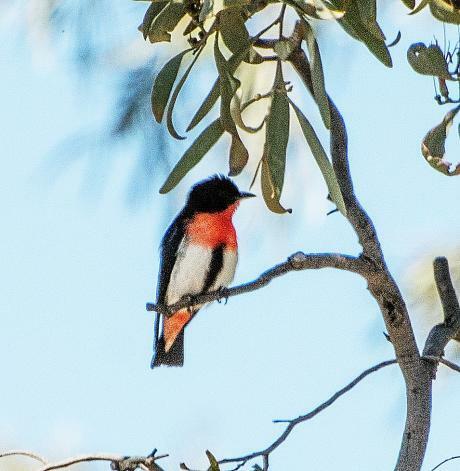 The Twitchathon, organised by BirdLife Australia, is a race in which teams aim to tick off as many bird species as they can in the allotted time. This year there are three categories so anyone (no matter how experienced or time-restricted), can compete! We chose the 12 hour ‘Champagne’ category. A Twitchathon is never just about counting birds and it was true this year. It started on Friday with the ABC presenter Simon Wallace. He had heard about Murrumbidgee Field Naturalist’s involvement in the Twitchathon. I was given a short couple of minutes of radio time on Friday morning to talk about it to listeners and the fact that we are raising money for the Bittern Project. Then on the road on Sunday at Fivebough Wetlands we observed a group of kangaroos several with joeys, heads poking out of the top of their mothers’ pouches. At Gum Creek Road we came across the farmer who explained to us that he had planted trees here with the purpose of attracting birds. It was here we saw the Painted Honeyeaters, Black Honeyeaters and Mistletoebirds. I suspect at this ‘Significant Roadside Environment Area’ (as it was sign posted) we only got a small proportion of the birds awaiting discovery. Time being of the essence we left here before discovering its full potential. At Barren Box Swamp as we drove around the track spying birds we also saw two large turtles. Two large brown snakes slithered across in front of us, giving a total of 4 snakes seen on the day. We shared the Barren Box shelter area with 2 blue tongue lizards and a nest of Willie Wagtails during our lunch break. Wattle Dam, in the Binya State Forest, was the perfect end to the day of birding. It made us wait awhile for the birds to come and settle in the trees just as the gold of the evening sun turned the scene. That evening we did a final count on species, 127 for the Silly Galahs team and 111 for the Bidgee Boobooks, sending our numbers in to the NSW Twitchathon Coordinator. Our thanks go to Ashwin Rudder who worked to make things run smoothly. This year the event was a national event and the money raised through sponsorship of teams goes to a bird conservation initiative, different for each state. MFN teams are the Silly Galahs and the Bidgee Boobooks. You can sponsor these teams by donating on line at https://www.birdlifetwitchathon.org.au/2017-teams or sending your donation to the Treasurer of MFN to forward on. NSW sponsorship money goes to Matt Herring's team for the Bitterns in Rice project this season. He is planning to use the money to buy a drone so that they can monitor the movement of bittern chicks in nests to see their behaviour without having to disturb them too much.